First instinct was to take off the front panel. This was the wrong way to do it. Going on four years ago, I bought a used Allen & Heath Xone:32 mixer off Craigslist from some very hip-looking guys in a loft right where the 10 meets the 5 east of downtown LA. While in my possession it’s seen and powered through all kinds of abuse. It ran more college parties than I can count, was transported in a backpack by skateboard with no hard case, traveled thousands of miles in the car trunk, even sat through the dust at Burning Man, all without so much as a sticky fader. Until now, when after one too many nights of service, two channels are having signal loss issues. I can’t rightfully complain, since by any reasonable measure this mixer should have met its end to a spilled red cup years ago, but by this point I was starting to think the thing was nigh indestructible. Repair is definitely worth it in this case, the issues with both channels seem like just loose connections or maybe a bad cap. At least in my slice of the DJ world this is a pretty common mid-range mixer. They are durable enough to use when playing out, they sound pretty good (oh that analog filter!) and are relatively inexpensive second-hand. So I was quite surprised to find not a single teardown or any real information online about what’s inside this thing. After taking the mixer apart I was able to get both broken channels back in operation. It turned out to be nothing more than loose connectors on the line faders after years of less-than-delicate treatment. Photos of the teardown process and the mixer internals are below. DISCLAIMER: This mixer is powered by mains voltage and the power supply has large capacitors that can maintain charge even after the device is powered off. Use these instructions at your own risk. Please don’t try this unless you know what you’re doing, and if you hurt yourself in the process I take no liability. There are several ways to take apart this mixer, but some take much more work than others. My first instinct was to take off the front panel. This turned out to be a mistake. It required taking off nearly all the knobs and mounting nuts and was difficult to reassemble given the way the output and filter PCBs are mounted internally. 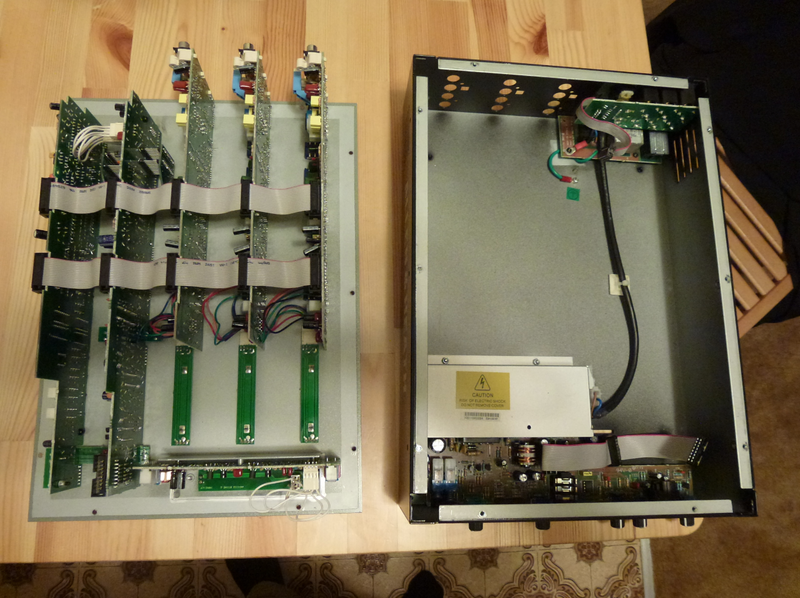 A much simpler disassembly involves removing the front panel with all PCBs still attached. 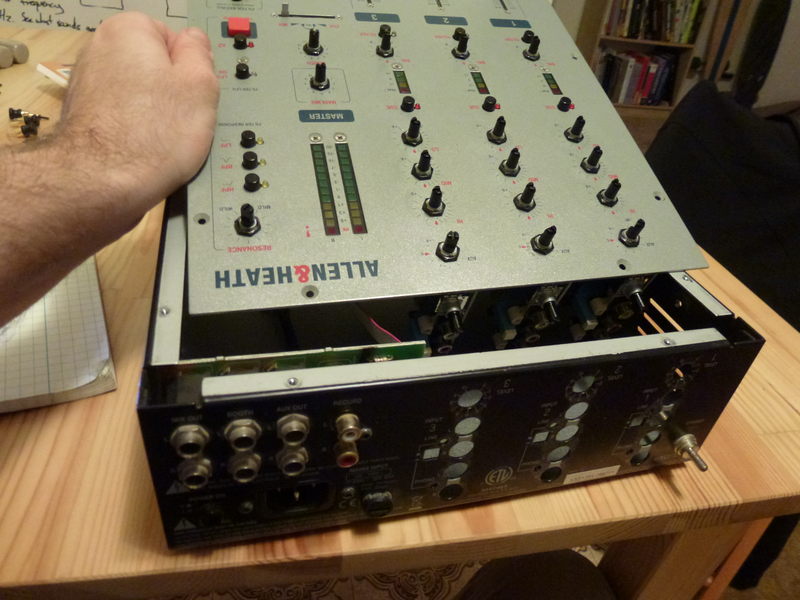 This is likely the way Allen & Heath intended the mixer to be taken apart, as it minimizes risk to the PCBs, leaves most knobs in place and only requires disconnecting two cables internally. The first step is to detach the channel PCBs from the rear panel of the mixer. 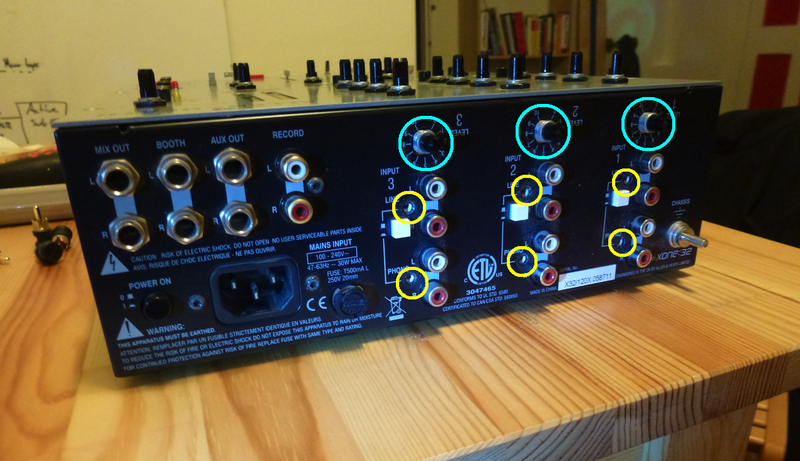 Remove the six black Torx T10 screws between each pair of RCA inputs on each input channel. Remove the gain knobs from the pots. I used a small flathead screwdriver and a paper towel to pry the knobs without scratching the paint. Remove the nuts from the base of each knob. A nut driver is your friend here, I used an 11mm socket. Next, remove the ten silver phillips screws around the edge of the mixer front panel. There is no need to remove the screws near any of the faders, any of the level meters, or the filter stage. At this point the front panel is detached from the rest of the case. 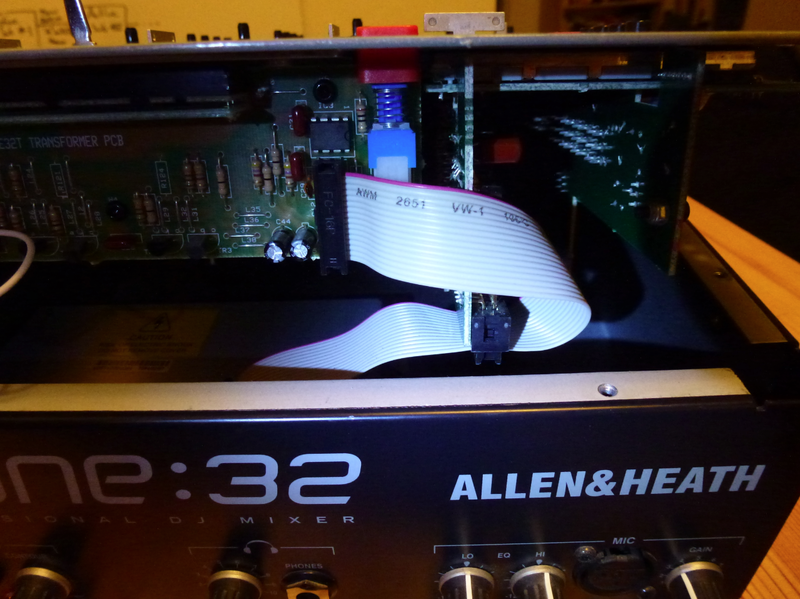 Carefully lift up at the base of the panel to reveal a ribbon cable connecting to the crossfader PCB and the mains and cue PCB. Note the orientation of the cable on the fader board – with the red conductor facing up – as the header is not keyed. Remove the cable from both boards. Continue lifting the front panel at the bottom end and slide it back to free the pots and connectors from the back panel. Push in all the phono/line buttons if they get stuck. Lifting up the right side of the front panel will now reveal a ribbon cable from the power and output PCB at the back of the mixer to the mains and cue PCB. Disconnect this cable and the top panel is free. 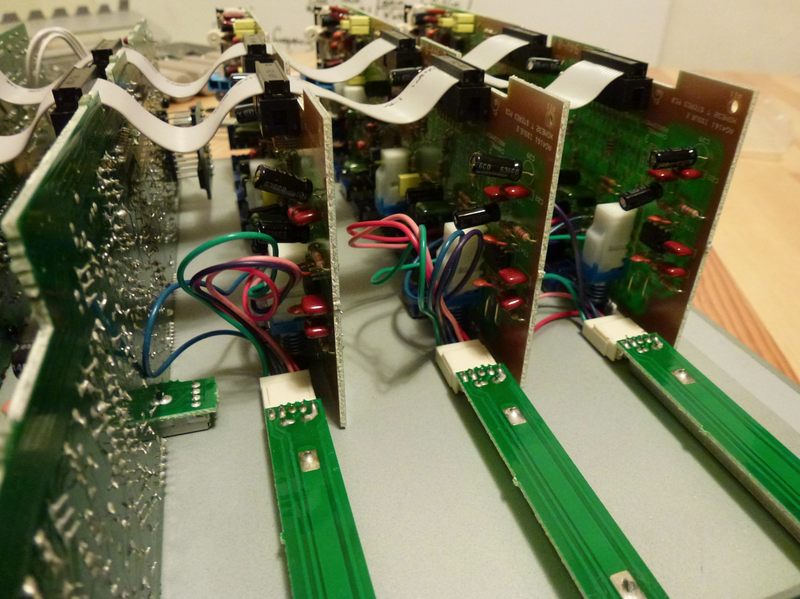 Attached to the front panel are five large PCBs: one for each input channel, one for the main output and monitoring section and one for the filter. Another smaller board handles the crossfader and transmute buttons. Each line fader has its own small PCB. The channel faders and crossfader connect via plugs and wires, the filter frequency fader and cue/mix fader boards plug directly into the larger boards. 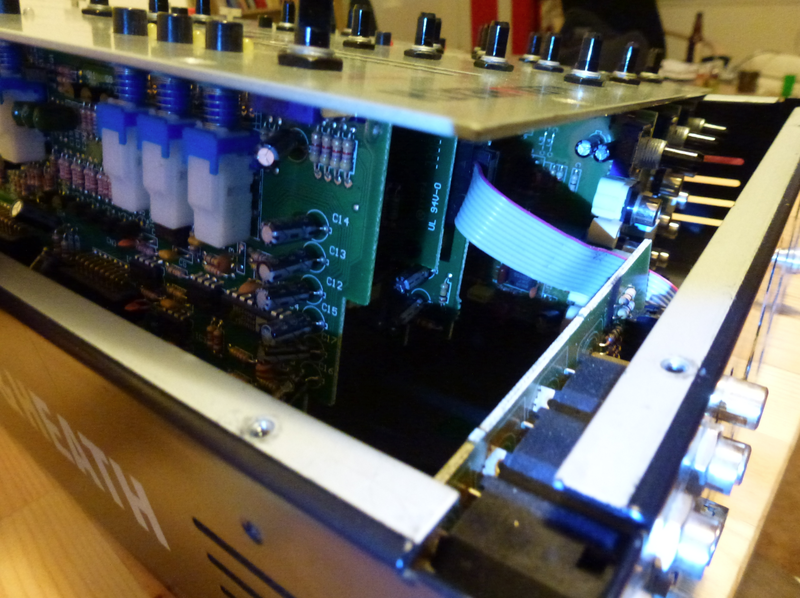 Left in the case are boards that provide main outputs, power supply, microphone input and headphone output. Two ribbon cables provide signal buses between the filter and output boards and the channel boards. The channels are identical with resistors and jumpers soldered in one of three possible places to attach to the appropriate channels on the buses. Only the mains and cue board and the filter board have two routing layers, the rest were single-layer. All components are through-hole. The way the mixer was failing, each broken channel had either the left or the right side working with the other losing signal. They displayed identical behavior, but one with the left side out and the other with the right. Gain worked properly, and the meter had the same readings as the working channel when set to the same gain. When the line fader was brought to full volume, a faint and distorted signal could be heard on the non-working side, suggesting a simple broken connection — the path was still capacitively coupled via an air gap and something still got through at high volume. Measuring the resistance of the line faders all components looked to be in working order. The faders were standard-looking dual 10k log pots. No broken connections were found on the fader connectors or the channel PCBs. But after disconnecting and reconnecting all the faders and the bus wires between the boards, testing showed the problem had been fixed. One or more connectors had been loosened over time and simply reseating them restored the mixer to full functionality! A bit more on the internals of this mixer, while I have it open. The design is mostly TL072-based. The Analog Devices SSM2164 quad-VCA IC is used in a few places as well. Transistors were mostly BC556B and J111, with some BC549Cs on the filter board. The filter also appears to use two 8-pin PIC microcontrollers, one labeled “MAIN PIC” and the other “LFO”. The PICs are the only socketed ICs in the mixer. The mains and cue board has more of the same components plus a CD4053BCN 8-channel analog mux IC. The main level meters are driven by LB1412 level meter driver ICs. Amusingly, surface-mount versions of this chip were used on adapter PCBs to match the through-hole footprints on the main board. If you’re having problems beyond loose connectors, the mixer is pretty repairable if you can isolate the bad part. Line faders can be removed with a Torx T5 driver and most of the parts used in the design should have replacements readily available. And having no SMD components (except that funny LB1412) means nothing besides a scope, a meter and a basic iron are required to make repairs. I had a small problem on my xone 32. I have two resistance burnt persons. Can you m send a photo of the electronic board situated under the crossfader? I need to know the value of these resistances. That would be really very nice. J use a translation software then saddened for my down-market English. Thanks for this tutorial, I don’t need this now but can see it being very useful in the future. Appreciate all the work you put into this. Cheers, had a right ch down on fade 3, 15 min fix, done. Any opinions on whether it is possible to relocate the trim knobs to the top face where God intended them to be? 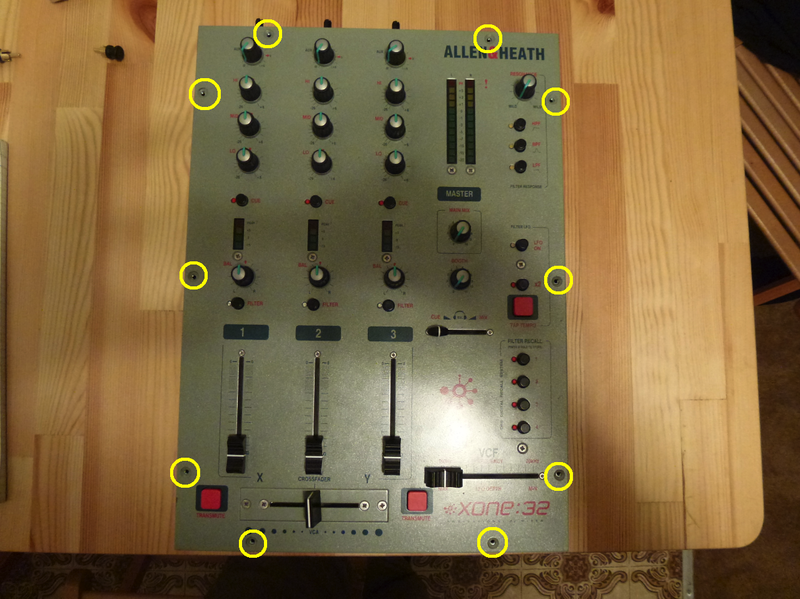 hi there, thanks for your post on how to open the xone32, i´m glad that i found someone who´s good at fiddling around with that friendly mixer. i opened mine because i really don´t want to give it away but i´m also obsessed by the idea of heaving the “level” potis on top (instead of at the back – why?). the “aux level” potis, which i personally don´t use at all would be perfect. would someone have any idea of how to switch the mapping of the two nearby potis? i´d be thankful for any hint. Thanks for your post. I exactly have the same problem on a new Xone 32, only having two channels, 2 lines channel + 2 phono channels, swithcing from one to another using a button. My phono channels are dead like you described, but considering those two lines channel perfectly working I’m wondering what can be the cause. Thanks for the clear directions to access the circuit boards in this mixer. even tried switching the identical flat cables. I’ve a problem with the cue. The cue button only works for channel 2. For channel 1&3 the headphones play the mix (same as mixout) no matter cue is on or of. The red lights work when pushing the cue button, but no effect on the headphones, it just plays the mix. And of course the cue fader is on the left, on cue. Not much activity on this forum lately, but maybe someone comes along and has an idea what problem is with my mixer. I love this mixer and i would like to fix this problem because now it’s useless. Looking through the schematic in the service manual, pushing the cue button sends a DC signal (eg CUE1_RD for channel 1) to the main PCB, which has a PIC12 and a few IO expanders. The PIC in turn uses a separate signal CUE1_DC to actually activate the cue for the channel – that signal switches on the cue LED and the transistors that add the channel’s audio to the cue mix bus. So if you’re getting as far as the light coming on, it means the problem is somewhere in the signal path for cue audio on that channel. Capacitors C45 and C46 could be likely culprits, or maybe CUE1_DC isn’t making it back to the gates of Q1 and Q2, or it could be a continuity problem with the ribbon cables or connectors… You’ll need to do some scope probing most likely. Thanks for your quick response. I never realised these caps could dry out. I’m not much of an electrician. I haven’t used the system for over a year now, maybe that doesn’t help too. I finished my project of fixing 2 worn out SL1210MK turntables yesterday and wanted to make my first mix with them and hooked them up to the :32. Then this problem occured. Maybe i’ll start the :32 project next christmas. All the best for 2017 and thanks again! Thanks Leo, this is really helpful. Going to dissemble my xone 32 this evening.